There was nothing to be done until crossing the open area in front of us was imminent, except get hold of some of the rations and water. My letter home was in my pocket, forgotten for the first time, my full attention and following thought process had been unable to refocus after the three body bags were loaded into the choppers. I’d forgotten to mail my letter home. Belatedly, I wondered if it mattered. Would Marine mail get through the Army system and make it all the way home or would it be discarded into some holding or dead-end bin? Before I could get my things together enough to get ready for the coming mad dash to the distant tree line Nguyen showed up, lugging one of the white plastic bottles of water and some big green envelopes stuffed into his utility pockets. He dropped his load with a thud, and then several of the packets. We exchanged glances but neither of us spoke. For some reason the Kit Carson Scout communicated more loyalty and respect in utter silence than any of the others in my small team, with the possible exception of Fusner, could do in speaking. I picked up one of the thick green envelopes. Food Pack, Long Range Patrol Ration was printed in black letters on the deep green background. I held food packet number two, which was labeled ‘Chili Con Carne.’ The bag had been made by a bag company in Rochester, New York. If the food was any good, I mused to myself, I would put that place on my places to visit if I got back to the world. I refilled my two canteens with Fusner’s help, the big plastic bottle being heavy, slippery and cumbersome to handle. The instructions on the package said I had to heat three quarters of my canteen holder with hot water, so I poured that too. One pound of water, or thereabouts, I recalled from my conversation with the Gunny earlier. I waited for the water to heat over my explosive little fire, poured the contents of the bag into my canteen holder and then began to eat with my single combination fork and spoon. The chili tasted like nothing I’d ever tasted before. I looked around to see if any of the rest of my team were eating it but they were taken up with heating and eating whatever they had. All the food kind of looked and smelled alike. I went on eating, reading the back of the envelope to pass the time. Two thousand calories were supposedly being transferred from the tasteless bag contents to my body but it seemed like a whole lot less. I looked around for the Gunny but he had not returned from his mission to talk to both Jurgens and Sugar Daddy about the coming move. I took out my government-issue black ball point and wrote another letter to my wife. How I had forgotten to mail the one in my pocket was bothering me more than I could explain to myself. Was I becoming lost down the rabbit hole I’d fallen into to the point where I was losing perspective about what was important and what was not? I tried to write, but could not. What was I going to write? One of those existential tomes I’d read by the great philosophers in college but never really understood. Nihilism? I was living it. Abandonment? Right here with me like a cloying mosquito-bitten friend. I could write none of it. My wife had to be tired of reading about what Fusner looked like, what Stevens was up to and why I had scouts who never scouted anything, anyway. I could write her that they were scouting all night long to make sure none of my Marines, with some good cause, were coming through the mud and mess to kill me. I grimaced, pen in hand. My hand was not shaking though. Terror was becoming the dark moving creature that accompanied me everywhere but no longer lived deep inside whatever core I still had left. Terror was the NVA ready to kill me in the crossing of that open area. Terror was First Platoon. Terror was Fourth Platoon. Terror was a crazy M79 grenade launcher who shot anything that moved, or didn’t move. I wrote: “The weather is cooler up here at this higher altitude. I’m going to this lovely valley inland called the A Shau. I’m not sure you can even find the place on a map in the library back there. I don’t know how far it is or what the weather will be like there. I ate chili today and it was pretty good.” I thought for a moment, looking over at my child-radioman. “Fusner says hello.” I signed the letter and put it in one of the little blue-colored envelopes with the shape of the country on it. No matter where terror was around me I swore I would not forget to mail my letter home again. I had only Mary and Julie no matter how few days I had left. I had something. I jammed the envelope down into the pocket that held the other one, checking to make sure it was still there. The Gunny came loping back to his hooch, moving faster than I’d ever seen him move before. As he passed by my small mud area he tossed a packet onto the only dry part of my poncho cover. I was about to ignore the package and crawl over to the Gunny’s hooch when the edge of a map stuck out of the side of the clear plastic bag. I stopped, grabbed the bag and tore it open. Half a dozen one to twenty-five thousand contour interval maps fell out. Relief flooded through me. I could not call artillery without a map. Without an accurate map of any area all I could do was adjust fire from the gun target line or simply guess at where we might be. Both of those methods were eventually terminal in result. It only took me seconds to orient myself on one the maps. I looked up to where the berm we would have to go over to cross the open area was located. We weren’t even close to the A Shau Valley. It wasn’t even on the map, although I knew the direction where it had to be. I hunted through the others until I found it. I’d thought we were moving a few thousand meters to the valley but our move was going to be whole lot longer than that, as the A Shau was a good twenty thousand meters ahead and the terrain was all mountainous with poor cover and little concealment. “Death march,” I whispered to myself. Where would our supporting fires come from? Cunningham fire base was on the edge of the valley firing away in our direction. Calling them was almost as bad, for accuracy purposes, as calling back to my own battery, although we would be slowly getting closer to the Americal the more we traveled. There had been no geography classes at The Basic School in Quantico. The first Vietnam map I’d seen had been examined in country a week ago. I wondered why they had taught us so little, even though they all had to know exactly where we were going. Almost all, I reflected. The senator’s son had not gone with us. On the last day of TBS Major Kramer had announced the occupational specialties we were to be assigned. That’s where I’d been assigned to artillery and ordered to Fort Sill. Sam had been the only officer to get a really different and weird specialty. He was to become a reporter for the Stars and Stripes and be sent to Korea. He’d been mortified by the public announcement, made by the heartless major in front of all 246 of the rest of us going to Vietnam. Sam had broken down and cried. I’d felt so sorry for him. Until now. I now knew I’d change places with him in an instant and I would not care who I had to cry in front of to get the assignment. I folded up my maps and stuck the mass into my morphine pocket. I never had to check the morphine. I knew it was there waiting, and it knew I was there too, waiting. I crawled over to the Gunny who was making his usual canteen holder of coffee. “When do we kick off?” I asked, making no move to get my own canteen holder out. The Gunny didn’t reply, so I waited, my ability to squat for long periods, without pain in my ankles or knees surprising me. “But you came back,” I said, wondering if I sounded stupid. The Gunny sipped coffee and then smiled one of his uncommon smiles. For the first time I realized he had wrinkles on his face. The Gunny was old. “I didn’t come back,” he said, slowly, looking far beyond me over my shoulder. His expression was dead, once the smile faded from his lips. I almost gave in to a powerful temptation to turn and see what he might be seeing behind me. But I didn’t. “What does battalion say?” I asked, changing the subject as fast as I could. I thought of asking about being brought in on all command communications but afraid of the expression the man still wore on his aging face. I couldn’t believe I’d missed the fact that he was so old. I knew he had to be at least thirty-five or forty. My shoulders slumped. I would never see twenty-three, much less forty. “You’re the Gunny to me,” I finally said, not knowing how to make him feel any better. “Are you the same man you were a week ago?” he asked, after a few seconds. I didn’t know how to answer his question. My left hand reached down to clutch my letters home. My wife had to think I was the same person. My daughter could never know because she was too young to have known me before I left. If somehow I lived after Vietnam, I would try to make sure no one would know. I realized, coming to my feet slowly and starting to back away, that I did not know who I was or what I had been before. It hadn’t been important to be anyone before. I was just me. The Gunny was telling me that I wasn’t me anymore and that I never would be again. The Valley of No Joy. The words would not leave me. How had someone thought them up and put them together? It was an awful expression and for the first time I began to dread going to the A Shau. “Gunny,” I said, knowing that my voice sounded a bit wheedling and weak, “there’s no place to come back to. All we have is the Marine Corps. Where’s Mike Company and Echo? Are they coming? And if they’re coming then battalion command must be coming too.” I hated having to ask but even in the asking I felt better than where the discussion had been going before. The Gunny wasn’t telling me anything and he was all I had. Whatever he was not telling me I didn’t need to know, and I had to think that way to survive until the night. He was old. He had to know. “I can use our battery for another five thousand meters or so up the trail, just like before, but the accuracy’s going to suffer and we are on the GT line,” I said. Then I dropped down again in to a squat and took my maps back out of my pocket. I laid one out in front of him, liking the plastic covering the Army had put over the whole thing. I would be able to call fire in the rain without hiding inside my poncho to keep the maps dry. I outlined how I could use the longer range 155s until we were out of their range but then we’d be dependent on the Americal battery with their limited air-dropped ammo supplies. We’d have to move very quickly through blown apart jungle and then very slowly through areas not so blown up and probably loaded with booby traps. The mountains around us were little different from what we would likely face on the way into the A Shau and it was nearly impossible to move along their flanks unless a path already existed. The undergrowth was heavy in some places and then impenetrable in others. The 60mm mortars would be useless, as well as the recoilless rifles and M79s. Our travel was going to be an infantry exercise and we were going to take casualties. “What about a truce?” I asked. Fusner pulled up silently behind me as I waited for the Gunny to consider what I’d proposed. “Joy to the world, all the boys and girls, joy to the world, joy to you and me, joy to the fishes in the sea …” played ridiculously from his small shoulder-mounted radio. The rock and roll song somehow catching an edge of what the Gunny and I had been talking about. The Valley of No Joy. “Second and Third COs are shake and bakes. Buck sergeants, corporals, whatever,” the Gunny answered. “They’re okay. Just waiting like everyone else. You’ve run in and around them but they don’t say much. They’re okay,” he repeated. “What are they waiting for?” I asked, but the Gunny was done talking on the subject. He got to his feet. I joined my scout team. They’d broken my hooch down and packed my pack while I’d been talking to the Gunny. We moved wordlessly to the berm and I took out my Japanese glasses to survey the area one last time. The new map gave me insight as to what was beyond the tree line. The path we’d be using would snake around the next peak but it wouldn’t be a climb. I reached for the already extended microphone and made my series of calls to the two Marine batteries. I would only call the Americal Division further along the way and try to use pinpoint fire instead of ammo-eating zone barrages. Fusner’s little radio belted out Waltzing Matilda as I ordered the fire. I had no idea what a billabong was or a jumbuck or a swagman was, but it didn’t make any difference. The Australians were some rough and tough soldiers and the song made me feel like I might be one of them under the right conditions. The new me. The new me who didn’t even know who the old me was. I got my pack on and made sure I was ready. The artillery coming in made everyone around flinch but not me. I wasn’t afraid of artillery. I was afraid that I might live and then be looking over other people’s shoulders like the Gunny had looked over mine. Well, I like the sound of that short sentence, although i must admit that I don’t really understand it. 69-70 Americal Division Infantry here. I just started reading and am hooked. I have been instantly transported to a time and place I thought/hoped I had left far behind. Your writing captures the moments in time and crystallizes the many emotions and thoughts that occur in battle. At this point ,day 7, it has been non stop. Did you get to the boredom stages as well? We seemed to alternate between boredom and terror and were thankful for the stretches of boredom. Our A.O. was Happy Valley, Death Valley, and protecting the refugee village Hiep Duc. I Corps Delta 4/31 196th LIB. Keith Nolan wrote a book about our experiences called Death Valley in case you want to read about a little later in the war. Last question is do you know if any of the lessons we learned so painfully were ever taught stateside or did the machine just continue chugging along dispensing useless and out of date tactics, equipment, and “facts”. Ron. It is not that they can’t teach these things to better prepare men and women for entering the real arena of combat. tell me that they did not know all this stuff from Korea and WWII, much less the two previous years of serious fighting in the Nam. part is a tough one for recruiters to sell. Semper fi, and thanks for your in depth comments. 2/12 Delta Co. 25th Inf. Cu Chi ’69. Million Dollar wound 05/01/69. Tripped booby trapped Grenade walking point near Tay Ninh. Medivac to 90th Evac. Five days later left The Nam flat on my back headed for 209th General Evac Hospital, Camp Drake Japan. Approximately 10 days and numerous surgeries later. Headed for the world hanging in a litter from the wall of Medical Transport. Landed back in The world and spent next 9 months in a surgery and rehab wards at Ft. Devins Army Hospital,Mass.Received 100 percent Medical Retirement.4 months wheel chair,5 more months later left for Cincinnati V.A. Hospital on crutches. 5 more months of more surgery and rehab and finely home. Just thought that I would share my exit from the Military. lay it out and tell it here. Thank you for reading and this wonderful rendition. MOTHERS DAY 1969 I was on LZ Professional in the VALLY OF DEATH C1/14 Artillary we almost got wiped out, but held our stand. 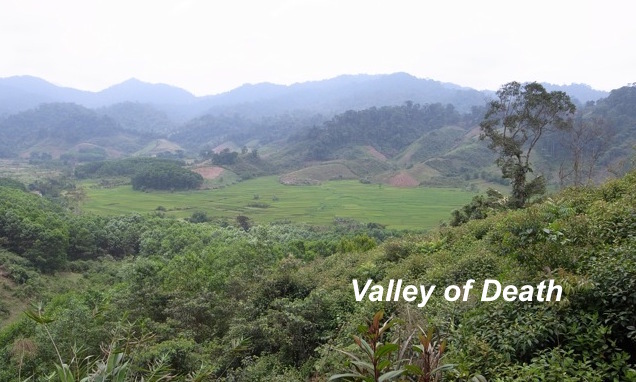 The valley was something because of how deeply entrenched the NVA were there before we went in. I don’t think we ever did really secure the place with all its rabbit warrens, caves and tunnels. Thanks from the artillery! And thanks for being here and saying something. One of the most dangerous thing in Vietnam was a 2nd Lt with a map and compass. To many John Wayne’s some smart enough to ask us WTF was going on and then listen. Had some good ones and some not so good. to deal with the reality. I wonder if things have changed in training. I don’t really think so or there would not be so many ten thousand yard stares combing back home from these current combat affairs…. Changes were made at TBS. A buddy of mine took over TBS in 2010. Made a lot of changes based on his experience as a Plt, Co and Btn CO. Brought in old salts to pass on wisdom. Took a lot of heat for his medthods and philosopy but turned out better prepared Lt’s. but had heard nothing about TBS and its agenda. Reading your story explains the 1st Lt. I had for my last 6 months in Korea. After his tour in the Nam, Korea was an amusement park full of half grown kids to boss around. Never upset, never bothered. I ripped off acting jack stripes because there would be no hard 5 for me and he said I don’t blame you, do we need orders for that. Coolest guy in S. Korea. medical committee to dump from the corps. I was the same way. I didn’t hang with other officers, strictly non-coms. I was total PTSD though because one night I had to duty and some Marines acted out in their barracks. My sergeant drove me up to the barracks. It was one of those rare windy forty something degree nights in California. The men would not calm down, shouting, fighting and so on. I took out my .45 and shot out the window along one side, then carefully put in another magazine and shot out the other side. That worked. The sergeant said I would go on report the next day or get a summary, but nobody ever said a word. Strange times. The sergeant loved the solution though! Think of standing down at the epicenter of a surrounding stadium as big as the Coliseum of Rome. Now think about many huge orchestras up in the rows and rows of seats playing Beethoven’s 9th, amplified a hundred times, and tens of thousands of choral members singing the aria of the fourth movement. Stunning, astounding, riveting and you are at the very center of it. That’s combat, except for the fright, the misery, the fear and the death and dismemberment all around. There is nothing like it in the world we come back to and the relief we all feel about getting the hell out of such a mess alive is buffered by the unspeakable unthinkable knowledge that at that time we lived on a plane of existence very few ever experience and none can properly describe. None of us can ever go back, just as none of us ever would. Welcome home, and I am happy and sad that you will never hear those symphonies play down upon you again. What an amazing writing ability and fantastic memory you have. It has been 48 years since I found myself as a 20 year old 2nd Lt. “commanding” a combat company in Vietnam. Stumbled across this series and have found myself fascinated by the memories the writing has brought from somewhere deeply buried within me. While reading, the memories of the mud, mist, confusion, sounds, fear and solitude of command have bubbled up until my stomach is in knots. Tried to discontinue the self inflicted nausea but found myself addicted to the memories. Waiting for the next segment. And there we were James. Those of us on that brutal, almost always fatal, road to discovery. They talked of the loneliness of command but they never talked about the terror of it. I too am with you telling the story with the same fear and agony in the writing that is coming through in your reading. Now that I have begun again, I can’t stop until it’s done, or I’m done, one or the other…. So when is the next segment coming? Your writing style and story are addictive. I’m hooked. the site. The Seventh night will be up in the next twenty four. Thanks for asking, commenting and liking the story…. > Keep it coming, Jim, and God Bless. No intrusion. It’s looking back through the open door to reality. The active memory of what’s behind that door and the wonder over whether that door will remain closed or whether it might open and have to be stepped through once more. The phenomenal world of the USA is so very much better, but that reality is there for those who know and have been through that door. “I realized, coming to my feet slowly and starting to back away, that I did not know who I was or what I had been before. It hadn’t been important to be anyone before. I was just me. The Gunny was telling me that I wasn’t me anymore and that I never would be again. The Valley of No Joy.” In every one of your segments, there’s the “jolt line”. I don’t have to look for it. It gives me a fist to the plexus as soon as I read it. That transformer thing that makes me you. The unprotected weak spot in my memory defenses. The uncounted times when I have thought about how I would have fared had the fiendishly fickle finger of fate not wiggled in my favor. I invariably blot out what I think would happen. I can’t even handle that. Keep writing, lieutenant. You got through it. I surely can too. my writing might just live up to describing how it really was. Yes, you would have gotten through if fortune had smiled, I am certain. And you are getting through now…my thoughts and friendship with you…. You fired for my company! Thank you so much Al. You guys were terrific. Have loved the Army ever since the Nam. After A.I.T. I left Ft. Sill on Nov.26,1965 to fly over to Nam. Thanks for the comment and the reading Russell. Man, you were there for the M-14 days. What did you think of that weapon in combat? Great stopping power,would go through anything, and always fired! We would tape two or three clips together for faster reloading. Thank you Russell. Some of the weaponry has to be used in the field under harsh circumstance to truly appreciate. you going to get enough ammo when you need it?